A 2,000-year-old body has been uncovered in North Bersted. The rare find has excited archaeologists who have labeled the discovery as being of international importance. The skeleton is believed to have been a warrior who died around the time of the Roman invasion of England in AD43. He is likely to have been a prince or rich person of some status because of the quantity and quality of goods found with his remains. 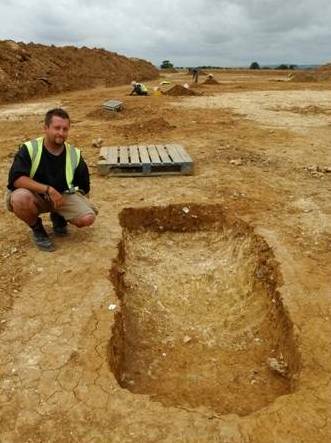 Dr Steve Ford, a director of Thames Valley Archaeological Services, said the site had yielded secrets beyond compare anywhere in this country. Of particular interest were two highly decorated bronze latticework sheets. These were probably used to cover a shield. “There is no comparison for this metalwork that we know of,” said Dr Fox. “It might well be unique. It’s a very intricate piece of work for its time. Professor Barry Cunliffe, the professor of European archaeology at Oxford University, visited the site when he was in Chichester and said he knew of nothing like this metalwork. The grave of the oldest body ever found around the Bognor Regis area was unearthed by archaeologists who have been given time to explore what lies underneath the surface of farmland before it is covered by housing. Allowing the dig is a condition of the planning permission granted by Arun District Council to the developers, Berkeley Homes and Persimmon Homes, before they use the land for 650 homes and part of the Bognor northern relief road. The requirements of the dig have been set out by the county council’s archaeologist, Mark Taylor. The digging has been based north of North Bersted Street. The discovery of the grave was made a few weeks ago but it has been kept under wraps until now to allow the valuable metalwork and the body to be removed to safety for detailed examination and away from the unwanted attention of illegal prospectors. Digging has been going on for several months. Dr Ford said the isolated burial was the main point of interest of the work. It was found just 40cms, or 16ins, below the surface. “These comprised three large pottery jars placed at the end of the grave, presumably containing offerings to the gods or food for the journey into the afterlife, an iron knife and several items made of bronze. “One appears to be a helmet and the other a shield boss. Also present are two latticework sheets highly decorated, perhaps used to cover a shield. 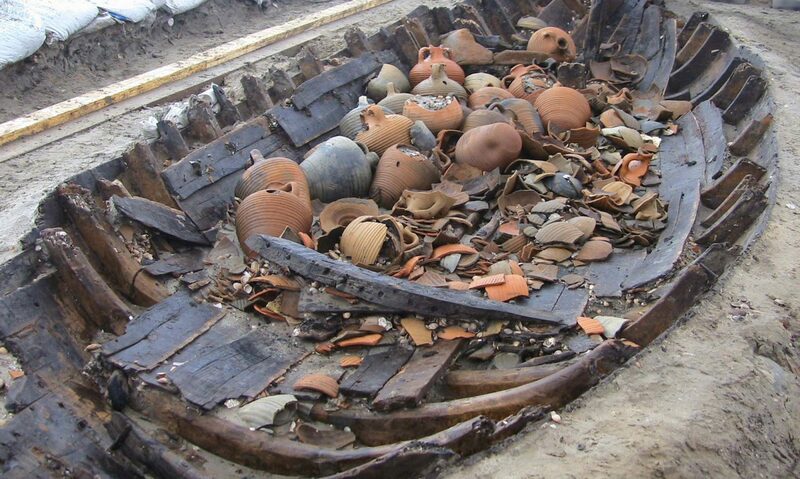 “The burial and its grave goods seem to have been placed in a large coffin or casket bound by iron hoops with an iron-framed structure place on top,” he explained. The bronze objects have been lifted in blocks of soil by a specialist conservator for careful examination and conservation in a laboratory before they are studied in detail. The North Bersted burial shared similarities with famous graves of the Late Iron Age in places such as Welwyn Garden City, St Albans and Colchester. All of them were graves of princes or chiefs, or possibly priests, he added. Also revealed in the excavations were revealed Bronze Age boundary ditches and occupation, a small hoard of four Middle Bronze Age bronze axes, or palstaves, an Iron Age roundhouse and a Roman building set among fields. Article retrieved from Littlehampton Gazette features a video too.